Styles of music come and go. It truly seems like sometimes when you’re finally getting tired of hearing the same type of music on pop radio, that’s when it fades into oblivion and creates a way for the next man up. Today’s band fell into that niche subculture movement and made a great go of it, since making efforts to revamp their style to keep relevant. Pete Wentz and Joe Trohman were friends in Chicago around the early 2000s. Wentz was a fairly large name in the localized punk rock scene during the late ‘90s, performing in various groups. After deciding to start something new, they met Patrick Sharp at a Borders book store and were intrigued. After thinking he’d be their drummer, they heard a short online EP where he was just playing acoustic guitar and singing—they had their front man instead. Calling themselves Fall Out Boy (a Simpsons character reference), their first performance was inside the cafeteria at DePaul University. After going through a myriad of additional band mates, the group seemed destined to implode. However, Wentz knew they had a solid foundation and could be their ticket to the top. They traveled up to Smart Studios in Madison, Wisconsin and recorded a demo. It would eventually get them noticed and they’d sign a record deal. Fall Out Boy (FOB) was set to release their debut album in May of 2003 amidst a decent following from playing live shows all over the Midwest. They kept grinding, playing larger gigs like the South by Southwest festival and the Warped Tour. They were even a featured artist within the store Hot Topic which was selling 2,000 to 3,000 albums per week. With all this on the rise, the label encouraged them to make a record that would enter the mainstream. 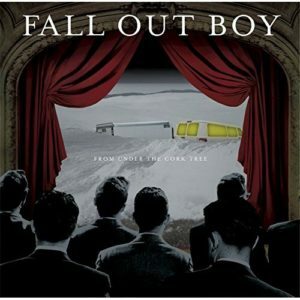 Taking it as a challenge, the band released From Under The Cork Tree in May of 2005. What happened next was a bit of an anomaly. Due to Wentz struggling with self-confidence at the time, the album was mostly about depression and anxiety. This resonated extremely well with teenagers, especially young girls. Because it was easy to get music on sites like MySpace at the time, the band began being heard all over the place. It would debut at No. 9 on the Billboard 200 and sell nearly 100k the first week. Backed by the mega-hit “Sugar, We’re Goin Down,” the album to date is approaching 10 million copies sold. This seemed to be the anthem record for the emo pop movement from the mid-2000s. It was hard going anywhere during this time and not hear that brand of music. FOB was nominated for a Grammy Award and was more or less the face of the movement. Because of the popularity seemingly being geared more toward a younger crowd, the movement perhaps never reached the height of say grunge, but still made a lot of young acts very successful. In the less positive reviews, they got lumped into the rest of the pop/punk bands, and were criticized for sounding no different. While maybe elements of that statement are true, you can’t argue what this album did for the genre. It completely changed the course of emo music in the mainstream and made every other band a little bit richer for it. The band took some time off, but is back at it now. While still making generally poppy music, they’ve shed the emo image and have even adapted to working with hip-hop artists to keep the sound fresh. For the low price of $5.99 today, you can transport back to 2005 today and relive the “Mmrs”. HLN joins the TDS TV Freedom Tier!